When students practice metacognition, the act of thinking about their thinking helps them make greater sense of their life experiences and start achieving at higher levels. How do children gain a deeper understanding of how they think, feel, and act so that they can improve their learning and develop meaningful relationships? Since antiquity, philosophers have been intrigued with how human beings develop self-awareness -- the ability to examine and understand who we are relative to the world around us. Today, research not only shows that self-awareness evolves during childhood, but also that its development is linked to metacognitive processes of the brain. Most teachers know that if students reflect on how they learn, they become better learners. For example, some students may think and process information best in a quiet library, while others may focus better surrounded by familiar noise or music. Learning strategies that work for math may be different from those applied in the study of a foreign language. For some, it takes more time to understand biology than chemistry. With greater awareness of how they acquire knowledge, students learn to regulate their behavior to optimize learning. They begin to see how their strengths and weaknesses affect how they perform. The ability to think about one's thinking is what neuroscientists call metacognition. As students' metacognitive abilities increase, research suggests they also achieve at higher levels. Through these reflections, they also begin to understand other people's perspectives. At a recent international workshop, philosophers and neuroscientists gathered to discuss self-awareness and how it is linked to metacognition. Scientists believe that self-awareness, associated with the paralimbic network of the brain, serves as a "tool for monitoring and controlling our behavior and adjusting our beliefs of the world, not only within ourselves, but, importantly, between individuals." This higher-order thinking strategy actually changes the structure of the brain, making it more flexible and open to even greater learning. Self-awareness is part of The Compass Advantage™ (a model designed for engaging families, schools, and communities in the principles of positive youth development) because it plays a critical role in how students make sense of life experiences. 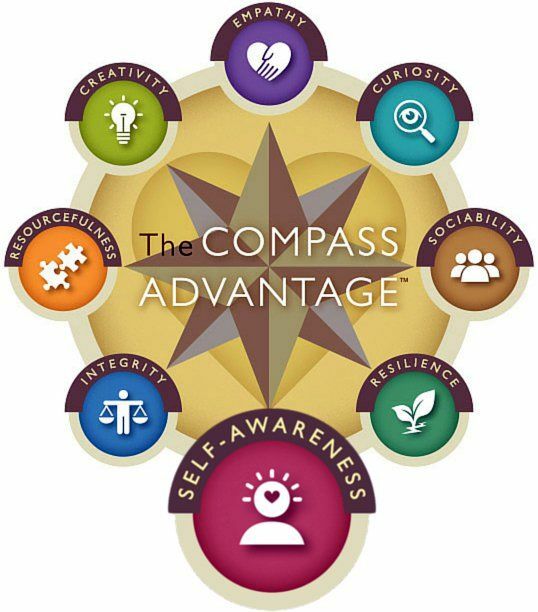 Linked by research to each of the other Compass abilities, particularly empathy, curiosity, and sociability, self-awareness is one of the 8 Pathways to Every Student's Success. Self-awareness plays a critical role in improved learning because it helps students become more efficient at focusing on what they still need to learn. The ability to think about one's thinking increases with age. Research shows that most growth of metacognitive ability happens between ages 12 and 15 (PDF, 199KB). When teachers cultivate students' abilities to reflect on, monitor, and evaluate their learning strategies, young people become more self-reliant, flexible, and productive. Students improve their capacity to weigh choices and evaluate options, particularly when answers are not obvious. When students have difficulty understanding, they rely on reflective strategies to recognize their difficulties and attempt to rectify them. Improving metacognitive strategies related to students' schoolwork also provides young people with tools to reflect and grow in their emotional and social lives. 1. Teach students how their brains are wired for growth. The beliefs that students adopt about learning and their own brains will affect their performance. Research shows that when students develop a growth mindset vs. a fixed mindset, they are more likely to engage in reflective thinking about how they learn and grow. Teaching kids about the science of metacognition can be an empowering tool, helping students to understand how they can literally grow their own brains. 2. Give students practice recognizing what they don't understand. The act of being confused and identifying one's lack of understanding is an important part of developing self-awareness. Take time at the end of a challenging class to ask, "What was most confusing about the material we explored today?" This not only jumpstarts metacognitive processing, but also creates a classroom culture that acknowledges confusion as an integral part of learning. 3. Provide opportunities to reflect on coursework. Before this course, I thought earthquakes were caused by _______. Now I understand them to be the result of _______. How has my thinking about greenhouse gases changed since taking this course? 4. Have students keep learning journals. What was easiest for me to learn this week? Why? What was most challenging for me to learn? Why? What study strategies worked well as I prepared for my exam? What strategies for exam preparation didn't work well? What will I do differently next time? What study habits worked best for me? How? What study habit will I try or improve upon next week? Encourage creative expression through whatever journal formats work best for learners, including mind maps, blogs, wikis, diaries, lists, e-tools, etc. 5. Use a "wrapper" to increase students' monitoring skills. A "wrapper" is a short intervention that surrounds an existing activity and integrates a metacognitive practice. Before a lecture, for example, give a few tips about active listening. Following the lecture, ask students to write down three key ideas from the lecture. Afterward, share what you believe to be the three key ideas and ask students to self-check how closely theirs matched your intended goals. When used often, this activity not only increases learning, but also improves metacognitive monitoring skills. 6. Consider essay vs. multiple-choice exams. Research shows that students use lower-level thinking skills to prepare for multiple-choice exams, and higher-level metacognitive skills to prepare for essay exams. While it is less time consuming to grade multiple-choice questions, even the addition of several short essay questions can improve the way students reflect on their learning to prepare for test taking. Reflexivity is the metacognitive process of becoming aware of our biases -- prejudices that get in the way of healthy development. Teachers can create a classroom culture for deeper learning and reflexivity by encouraging dialogue that challenges human and societal biases. When students engage in conversations or write essays on biases and moral dilemmas related to politics, wealth, racism, poverty, justice, liberty, etc., they learn to "think about their own thinking." They begin to challenge their own biases and become more flexible and adaptive thinkers. What other ways do you help students reflect on their thinking in your classroom?